The Gondola Blog: Smoking or Non-Smoking? My friend Emilia sent me this photo recently, and asked me if I thought gondoliers should be allowed to smoke on the boat with passengers. I talked to a few friends, and was preparing to build a long post on the subject, and then I realized that most of my readers probably also have opinions (and would like to share them). So this post comes to you as a forum. I'd like to hear your thoughts on the subject. 1. 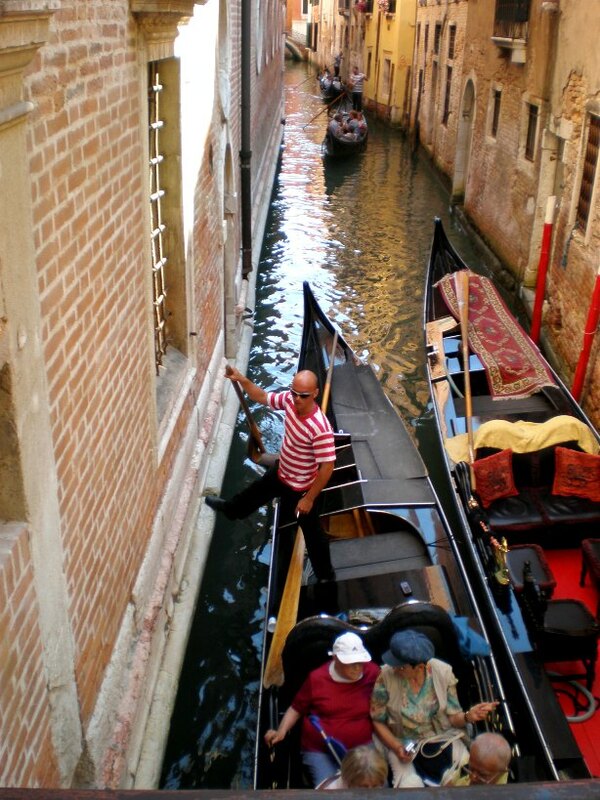 What's your first reaction when you see a gondolier smoking on board with passengers? Does it matter? 2. Do you or have you smoked while taking passengers on a cruise? 3. Are there rules or guidelines on such things where you row? Do you think there should be? and one who didn't smoke on cruises, would it matter and what would you choose? I would 10 times prefer to see that than to see a gondolier texting. I've snuck a quick text here and there. But not like some videos/pictures I've seen of gondoliers engrossed in a text conversation. Just betrays the image. Smoking not so much. I think it is as equally unprofessional as being on a cellphone while rowing. IMHO gondoliers should not smoke or use the cellphone while rowing with passengers. They are not only "gondola drivers" but even guides and the image of one of the most beautiful cities in the world. 2. I smoked a cigar (given to me by the passengers) on a gondola before. 3. Where I work there is no smoking, no chew, no phone calls or texts(except in emergency). 4. Always non-smoking unless of course, the choice is between friend and stranger. > Nereo said: "They are not only gondola drivers but even guides and the image of one of the most beautiful cities in the world." On the other hand, boredom can kick in for non-venetian gondoliers, who work in less lively places and face the same sparse environment every season. Phones: maybe don't carry one, just a PMR walke-talkie for keeping contact with the HQ and then there is no lure to text? Smoking is probably the very anti-thesis of a gondolier, who needs big lungs for both the row and the singing. For walkman: that was probably some auto-suggestive course tape, like "I am calm, I'm not going to hit that annyoing brat over the head with this precious remo... I'm not going to yell at the speedboat owner, who swamped my gondola late last week..."
Finally what about profanities? I know it is essentially impossible to avoid in venexian, but do you think gondoliers elsewhere should be equally foul-mouthed to be authentic, or rather maintain a falsely civilzed approach? I agree with you in regard to the need to be healthy. I'm always amazed and sure you have seen world cup futbol players get off the pitch and go strait for a cigarette. Unbelievable! I didn't really consider what the gondolier could be listening to on his walkman (obviously that was a few years ago) Your suggestion is a good possibility. Profanity? Were I am, we must maintain a "falsely civilized approach."